The smoke haze over the European part of Russia (EPR) and Belorus in July 2016 has been studied with the use of aerosol optical thickness (AOT) data measured by MODIS satellite spectrometers. The AOT maximum on the territory limited by coordinates 45°–70° N and 20°–60° E reached 2.95 on July 24, 2016 with an average regional value of 0.48. The total mass of smoke aerosol without the area covered by clouds was 0.73 million tons. Analysis of the wind fields and five-day back trajectories of air mass movement showed that the smoke was transported by the northeast winds to the EPR and Belorus from western Siberia, including the Yamalo-Nenets Autonomous District, which was characterized by large forest fires from July 17 to 23. Simulation of the radiation regime of the smoky atmosphere indicated that the average radiative forcings of smoke aerosol at upper and lower boundaries of the atmosphere for the above-mentioned territory are –29 and –54 W/m2, respectively (the extreme values are –124 and –154 W/m2, respectively). A comparative analysis of the smoke haze characteristics over the EPR in July 2016 and in summer 2010 has been conducted. According to ground-based measurement data, the mass concentration of PM10 during the smoke period from July 24 to 27 in the Moscow region reached 0.25 mg/m3. The authors are grateful to the MODIS team for providing us with satellite data. They are personally grateful to B. Holben, A.P. Chaikovskii, M.V. Panchenko, S.M. Sakerin, M.A. Sviridenkov, and N.E. 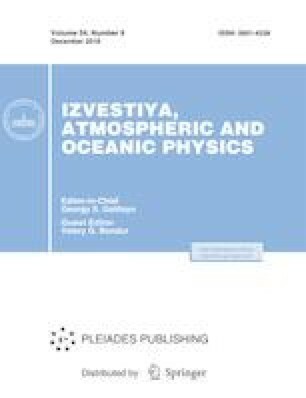 Chubarova for providing us with AERONET data, to Mosecomonitoring (Budgetary Environmental Protection Institution) for providing us with environmental monitoring data on the Moscow region, and to the reviewer for helpful comments. This study was supported by the Russian Science Foundation, project no. 14-47-00049, and the Russian Foundation for Basic Research, project no. 15-05-07853 (analysis of MODIS and AERONET data).